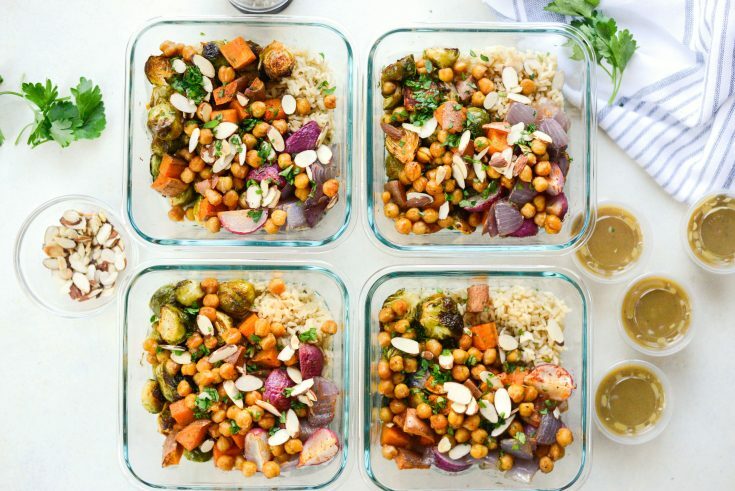 These Roasted Fall Veggie Rice Bowls are healthy, flavorful and great vegetarian meal prep idea. 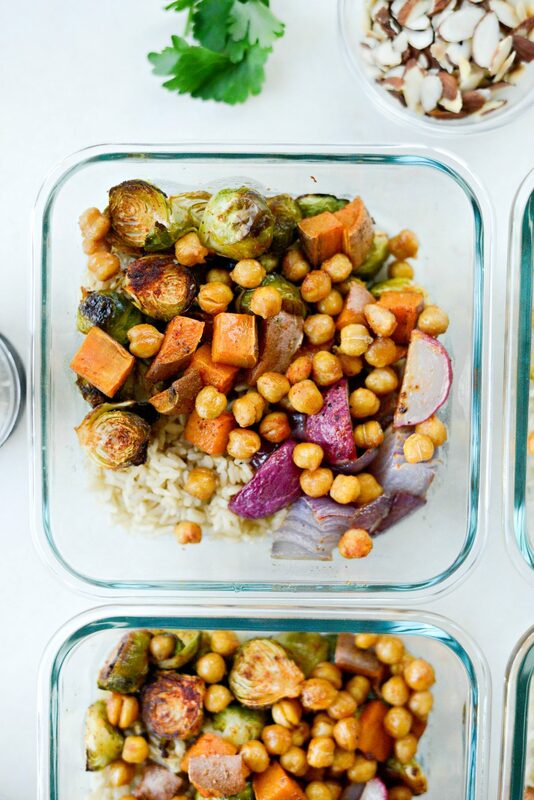 Sweet potatoes, brussels sprouts, chickpeas, onions and radishes are tossed in oil and spices. Once roasted, they’re served over cooked brown rice with toasted almonds and a simple honey dijon dressing. 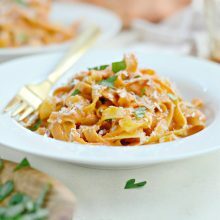 Makes 4 in about 30 minutes. It’s officially fall and the weather is finally cooperating. Weeks prior it has been miserably hot with temperatures in the high 80’s to low 90’s and I think it’s safe to say, we’re all over it. But now that the air is crisp and cool, cider mills are in our future and I can finally pull out my cozy cowl neck sweaters. Life is good. I spent my Sunday in the kitchen meal prepping my lunch for the week. It took me no time to pull this beautiful bowl of jewel toned roasted veggies and rice together. 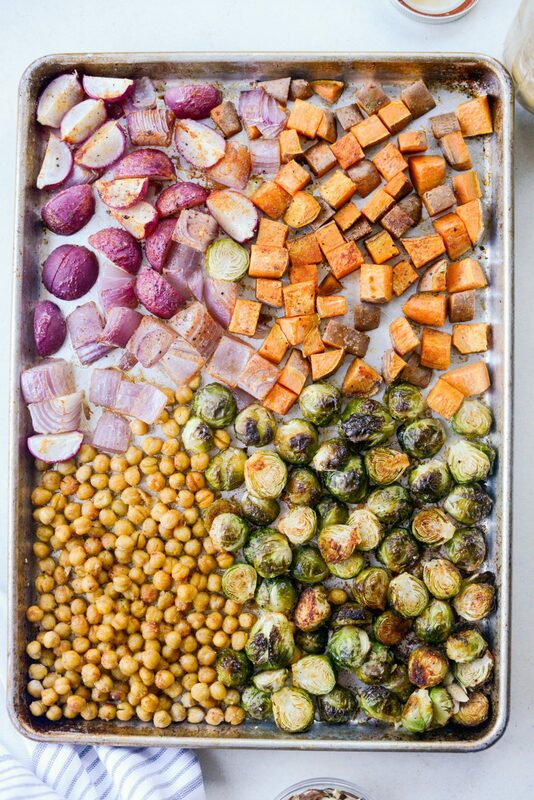 I opened my vegetable drawer and threw a plethora of colorful fall veggies onto a baking sheet with olive oil and spices and roasted them in a hot oven for 2o minutes. While that was in the oven, I had enough time to whip up a super simple dijon vinaigrette. 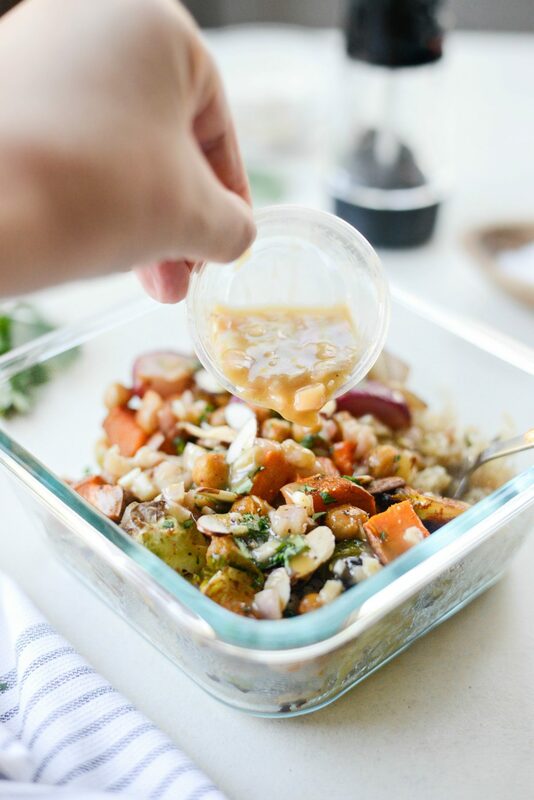 The flavors of each vegetable mixed with the dressing, crunchy almonds and earthy brown rice is soul satisfying. I could eat meals like this every single day. I’m also totally in love with these colors. Fall, I love you. 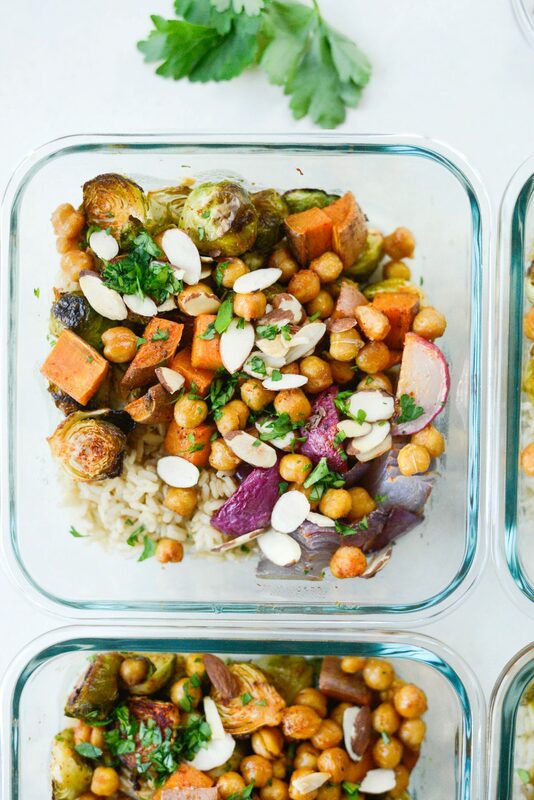 Here’s what you’ll need: 2 to 3 cups cooked brown rice, 1 pound brussels sprouts, a medium sweet potato [I know there’s two in the photo, but just ignore one of them ], 6-8 large radishes, 1/2 a red onion, 1 can chickpeas, olive oil, 3/4 teaspoon each of smoked paprika, garlic and onion powder. Of course salt and pepper to taste and toasted sliced almonds and minced parsley for garnish. 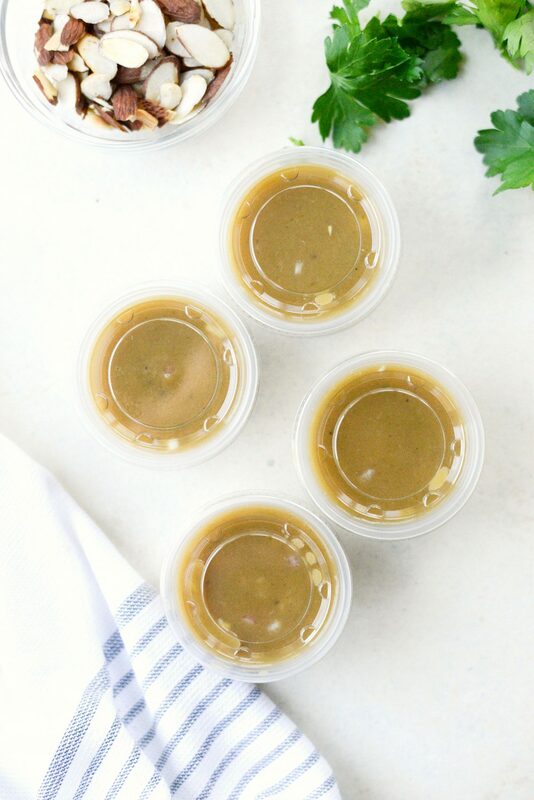 For this recipe I used my go-to honey dijon dressing. If you’ve made this recipe, then it probably looks familiar. In a small bowl or glass jar, combine the minced shallot, 2 tablespoons dijon mustard, 2 tablespoons honey, 1/2 teaspoon kosher salt and 1/4 freshly ground black pepper. Then pour in 2 tablespoons red wine vinegar and 1/4 cup olive oil. Whisk to combine or secure the lid to the jar and shake well. Next portion 2 tablespoons of the dressing into small single use or reusable containers. It’s not an exact amount, so you may have a little left over. But hey that’s okay, you can drizzle it over a salad. 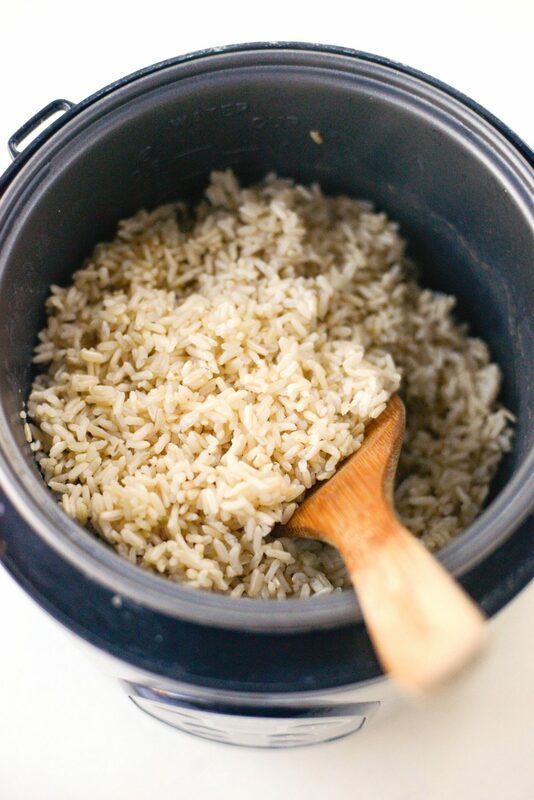 If you happen to have leftover brown rice, then you’re already ahead of the game. If you need to make a batch, add about 30 to 40 minutes to your prep time. Once your rice is cooked, fluff it with a fork and allow it to cool. Preheat your oven to 450°. 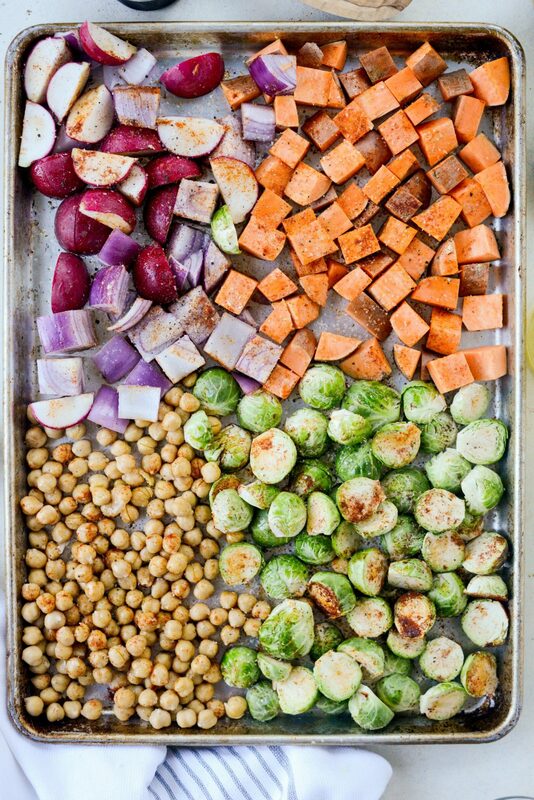 Then place the quartered radish, chopped red onion, diced sweet potatoes, drained and rinsed chickpeas and the halved Brussels sprouts onto a rimmed metal baking sheet. Next drizzle with a few tablespoons of olive oil and season with 3/4 teaspoon of each smoked paprika, garlic powder and onion powder. Then sprinkle with a few pinches of kosher salt and a few turns of freshly ground black pepper. Slide the pan of vegetables onto the middle rack of your preheated oven and roast for 20 minutes. Rotate your pan halfway through because you’ll want to ensure even roasting. 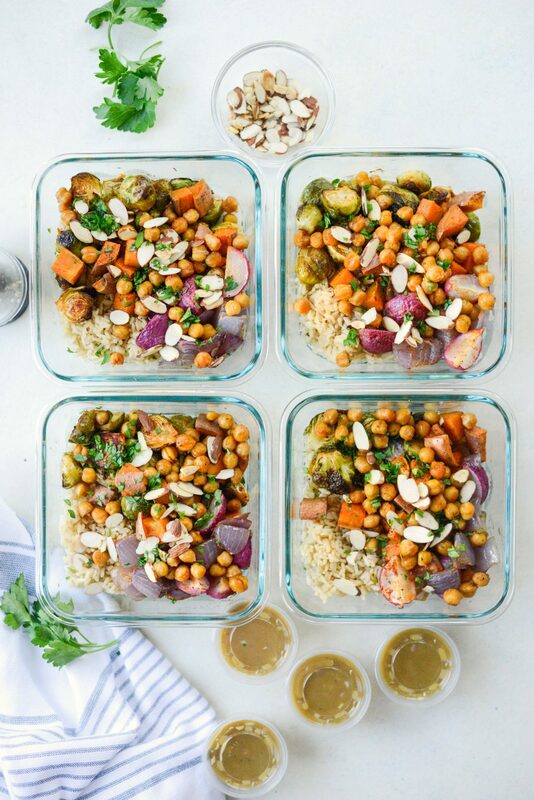 Next place a heaping 1/2 cup of the brown rice into four 4-cup storage containers and divide the roasted vegetables among each bowl of rice. Sprinkle with the toasted almond slices and minced fresh parsley. Lastly, nestle the dressing into the roasted fall veggie rice bowls and secure the lids to the containers. To reheat; simply remove the dressing and microwave the rice bowl uncovered for a minute or two or until warm. 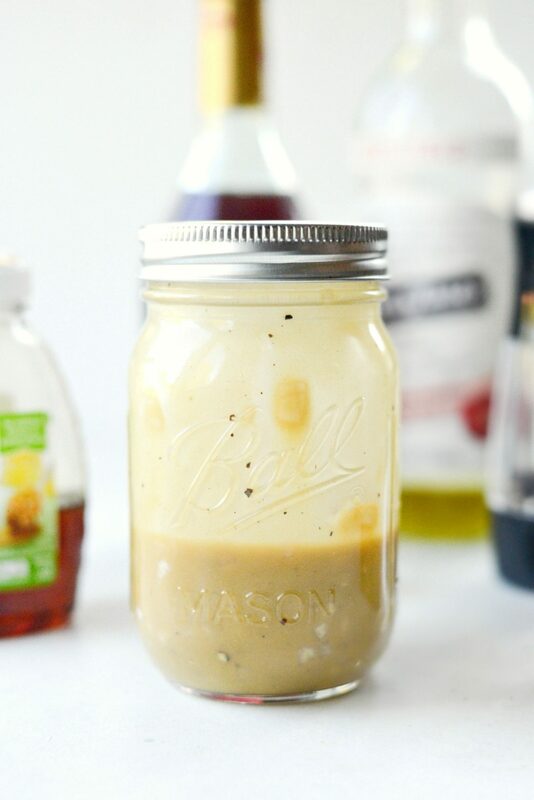 Drizzle with the honey dijon dressing and devour. 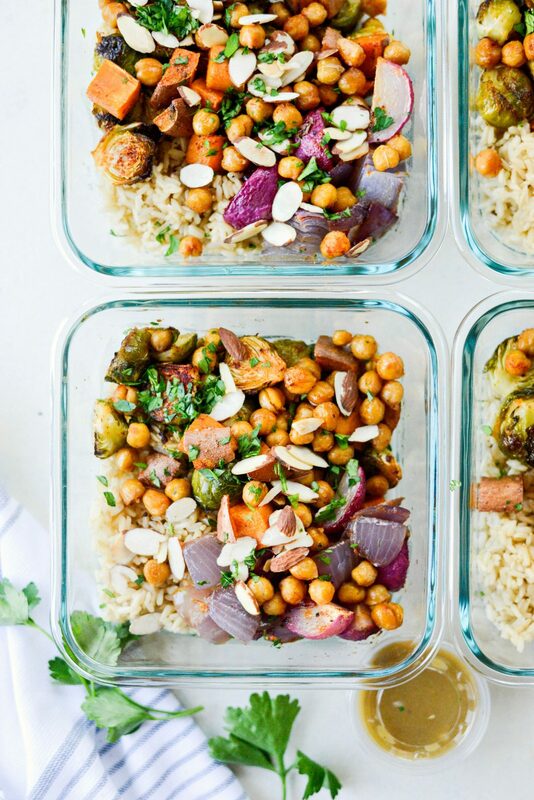 This recipe doesn’t have to be just for meal prepping. You could definitely serve this as two vegetarian main entree salads or as a side salad for your favorite protein. 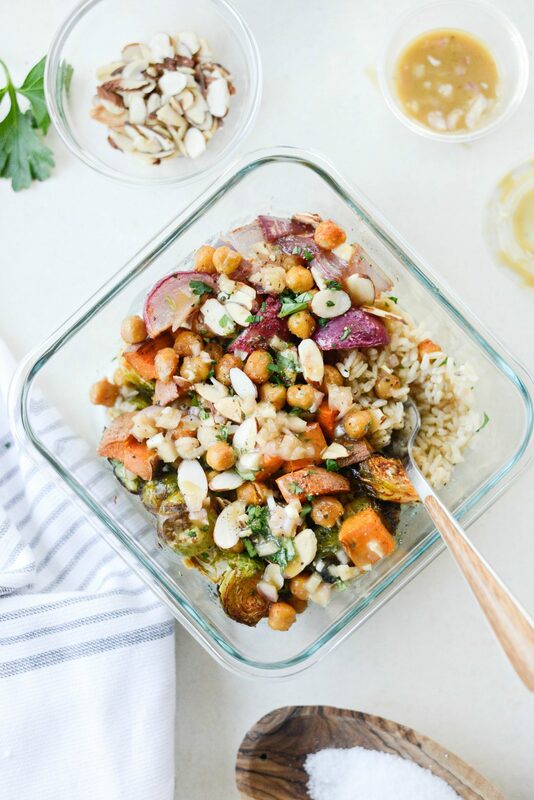 Finally toss the roasted veggies with the rice, toasted almonds and parsley and serve it warm with the honey dijon dressing on the side. Easy peasy. 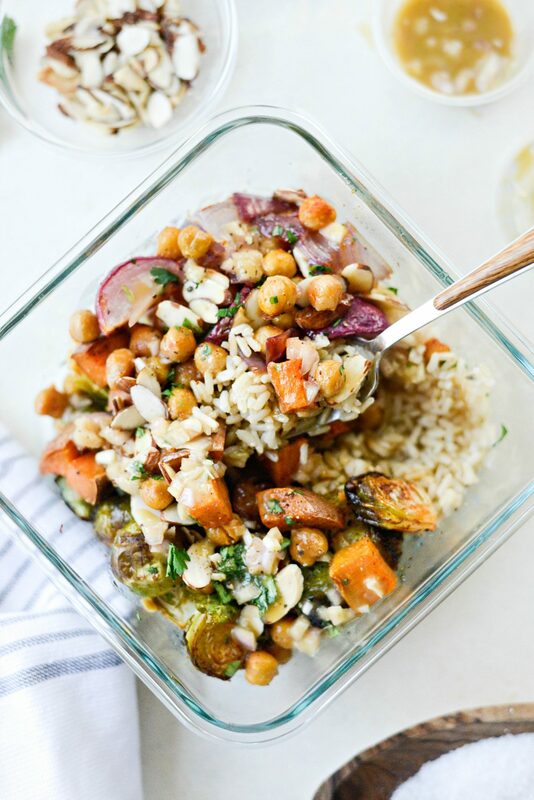 These Roasted Fall Veggie Rice Bowls are healthy, flavorful and great vegetarian meal prep idea. 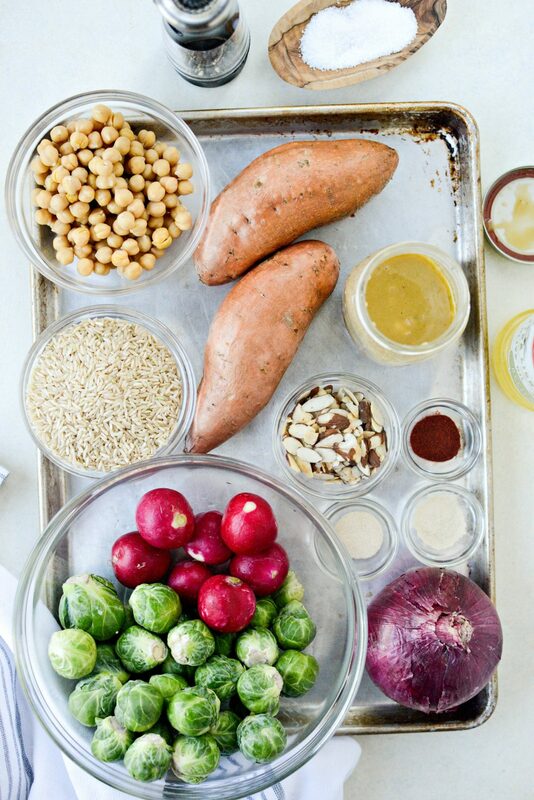 Sweet potatoes, Brussels sprouts, chickpeas, onions and radishes are tossed in oil and spices. 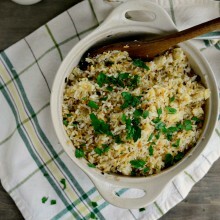 Once roasted, serve over brown rice with toasted almonds and a simple dijon dressing. 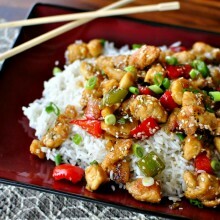 Makes 4 in about 30 minutes. 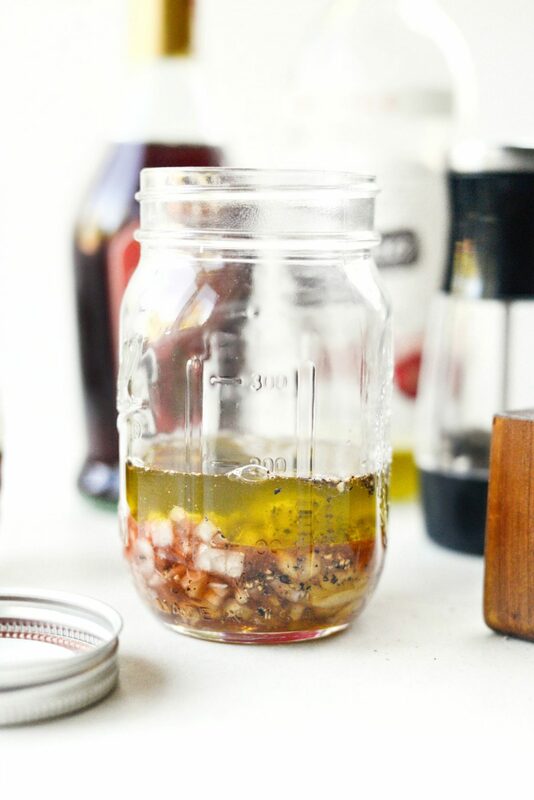 In a bowl or glass jar, combine the shallot, mustard, honey, salt, pepper, vinegar and oil. Whisk or shake to combine. Measure 2 tablespoons of dressing into small containers. On a rimmed metal baking sheet. 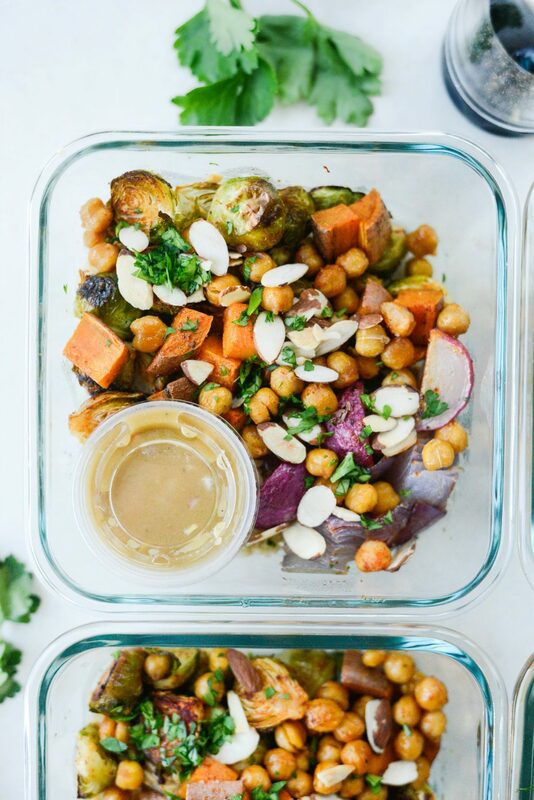 Arrange the Brussels sprouts, sweet potato, radishes, onion and chick peas. Drizzle with olive oil and season with smoked paprika, garlic, onion powder, salt and pepper. Toss to coat and slide the pan onto the middle rack of your preheated oven. Roast for 20 minutes, rotating the pan halfway through roasting. 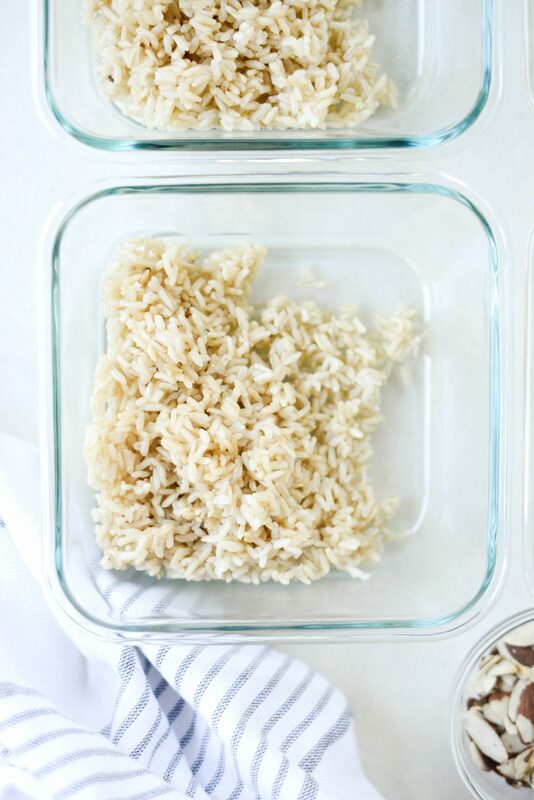 Arrange a heaping half cup of brown rice into four 4-cup storage containers. 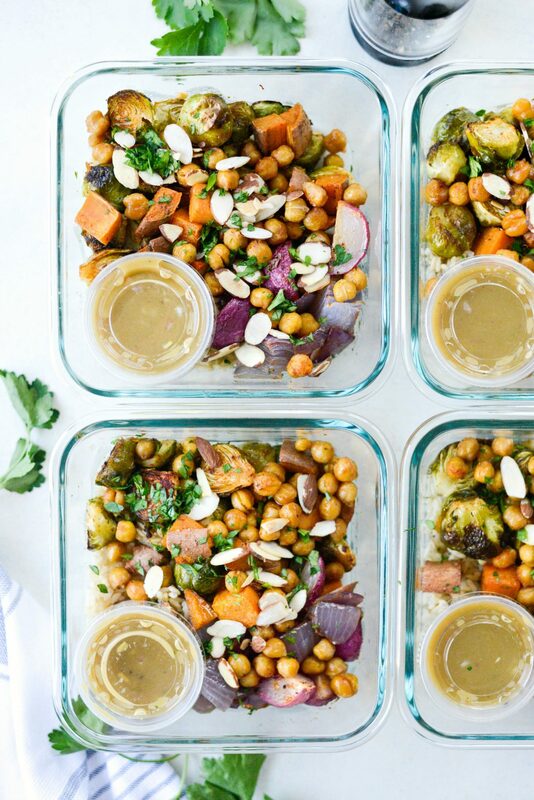 Divide the roasted veggies and top with toasted almonds and minced parsley. 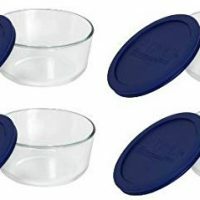 Nestle the dressing into each container before securing the lid. To reheat, remove the dressing and microwave uncovered for a minute or two or until warm. Then drizzle with desired amount of dressing. *To toast the almonds, simple add 1/3 cup to a dry skillet and heat over medium to medium-low until golden and fragrant. I bet these would be good cold too! This looks delicious. Can you tell me what type and brand of brown rice you use? Do you cook it in a ride cooker? Thank you!!! Hi Connie! I either use Simple Truth (Kroger) or Lundberg. And YES! I can’t cook decent rice without it!